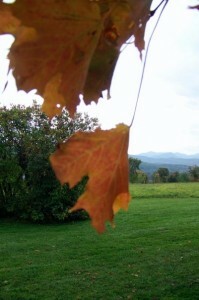 New England in the fall is one of nature’s masterpieces. We suggest starting your meandering journey into days old in the southeast corner of Vermont and looping up from there. Keep your eyes open for covered bridges, family farms advertising fresh maple syrup, and roadside waterfalls. Stop along the way. Because that’s what the New England pace is all about. Taking the road less traveled, and taking it all in. 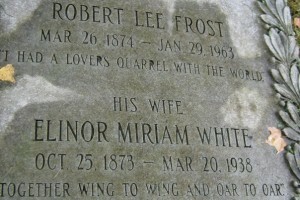 Robert Frost’s poems are recited and beloved in America. They evoke the emotions of living solitary and peaceful lives, surrounded by nature’s beauty and quietness. This great poet and his family lived in various places throughout New Hampshire and Vermont, and he’s laid to rest in Old Bennington, making this a great first stop on your trek north. Stop at the Old First Congregational Church in Bennington. Going back to colonial times, the church has a self-guided historical tour with interesting tidbits of knowledge to gain. In its cemetery, you’ll find Frost and his family’s stones, as well as many stones belonging to the Green Mountain Boys, the men who rose up to form a patriot army division during the Revolutionary War. You’re in Green Mountain territory, and you’re urged to drive out to the Bennington Battle Monument to learn more about their contribution to the win over British forces, and to get some elevation to take in the mountains of gold and red. 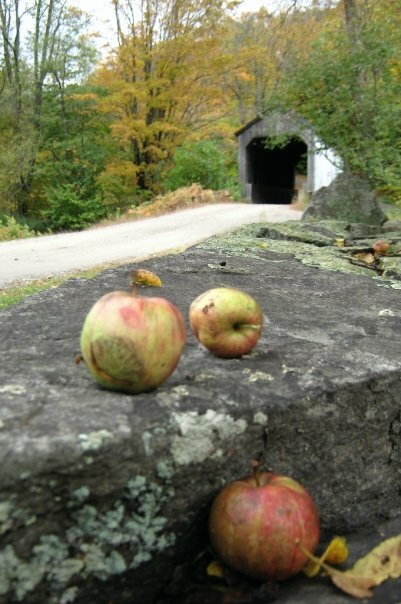 Drive up Highway 7 or Highway 7A to Manchester, taking in the covered bridges and roadside parks along the way. Hit some back roads with the help of your GPS and you’ll find even more photogenic and unique spots. 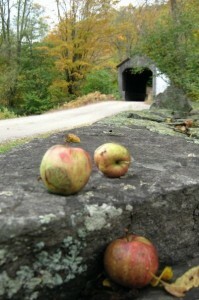 There are rushing rivers, boulder-strewn creek beds, apple orchards and sunflower fields. Every curve in the road seems to open up a new picture frame of colonial New England charm. Out of Manchester, continue north on Highway 7, taking alternative routes north as you like, toward Burlington. Rutland is on the way and offers up lunch opportunities and plenty of maple syrup farms in the nearby hills. Watch for signs and stop. You’ll find some of the best (and best prices) syrup from these homegrown farms. Once you make it to Burlington, make sure to stop for some ice cream and the factory tour, if available, at the original Ben & Jerry’s. This is a must-do and quite informative. Burlington itself is brimming with activity and has a friendly artist-y vibe that’s easy to like. There are plenty of shops, eateries and lodging opportunities here. Now it’s time to loop back toward Woodstock, Vermont, unless you plan to take in some ski slopes north of Burlington. It starts to get a little more remote much past Ben & Jerry’s so we suggest heading east on Route 15 to Route 100 south to Route 107 east to Route 12 south. Enjoy the drive. There are curves and hills and adorable general stores just waiting to be explored. Woodstock itself is a destination that’s worth a stop for a day, if you have the time. There are boutique shops, restaurants, a cheese store (yes, with free samples of aged Vermont white cheddar) and the scenery around the town is prime Vermont. From Woodstock, take Route 4 west to 100A south to 100 south. Just past Tyson and Lake Rescue, you’ll find a roadside gem you shouldn’t pass up—the Green Mountain Sugar House. This little store has some of the best maple syrup products you’ll find, at reasonable prices. There’s a special product they have called a Maple Creemee. Believe us, you’ll want to get a large one of these soft-serve cones. It’ll be what you’re talking about to your friends when you get home. Seriously. Delightful. Head on down 100 and you’ll come to Wilmington, which suffered Hurricane Irene’s wrath a few years back as it sits on the banks of a major river. The town has rebuilt after much of it being leveled, and the spirit of the people and this place are strong. After stopping in Wilmington, we’d recommend heading west on Route 9 through the national forest, back to Bennington. Consider taking in a hike or two in the forest on your way back to your starting place. 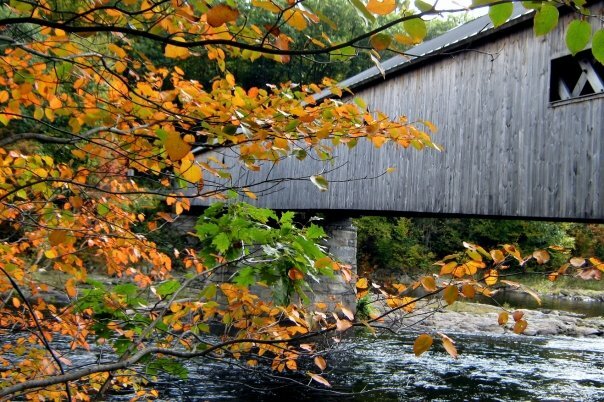 Tagged Ben & Jerry's, fall foliage, fall leaf peeping, leaf tours, maple creemee, maple syrup, Mount Washington, New England, New England waterfalls, New Hampshire, Norman Rockwell, Robert Frost, Vermont, Vermont cheddar, Wilmington, Woodstock. Bookmark the permalink.